With springtime finally upon us, it is the perfect time to take a look at your lawn and lay sod where needed. Sod loves cool weather and requires the temperate air and rainfall to lay the foundation for roots to take hold. Sodding your lawn is an investment that should be taken seriously and with much care. 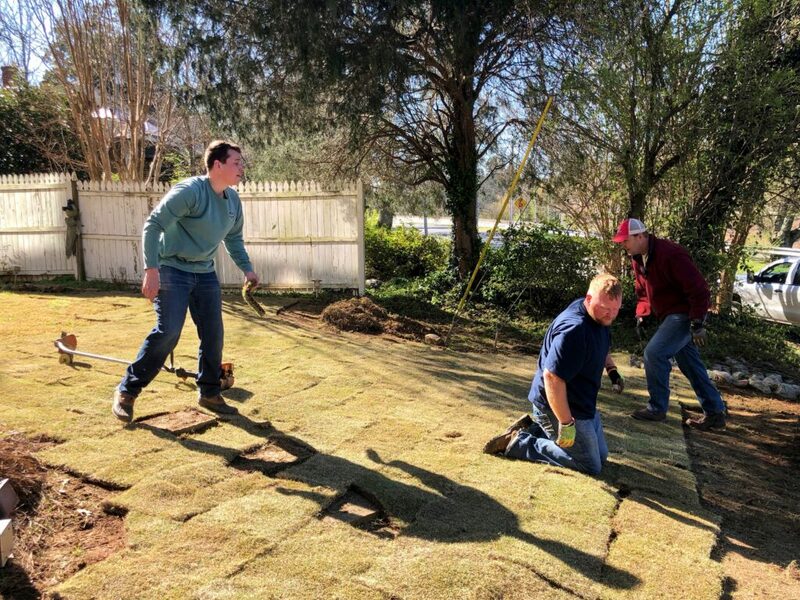 Proper steps for successful sod installation for your lawn will not only prepare the young grass for healthy growth, but also keep your lawn looking lush and beautiful for years to come. Take these needed steps to ensure your sod will flourish in its new home. Nothing promotes a healthy lawn like rich soil. Before laying any new sod, your soil must be combed over and readied for roots to attach and grow. Remove all debris, sticks, and large rocks. Fill any low areas with nice topsoil. Water the soil so it can settle. Sod should be laid within 24-72 hours of it being harvested. Fresh sod should feel moist underneath and have green, cool blades of grass sprouting from it. Lay the squares in straight lines with the edges touching no gaps showing. Cut squares to fill in irregular spaces and shapes. 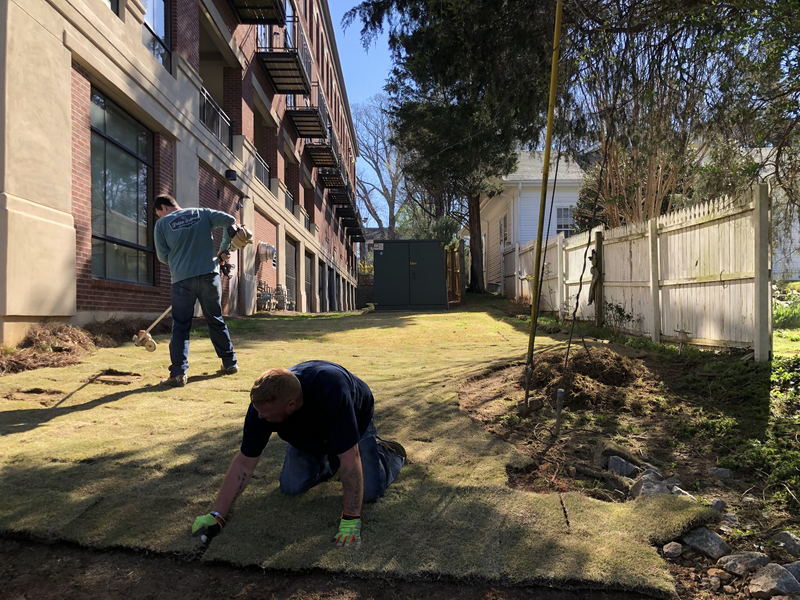 If your sod is delivered and cannot yet be installed, make sure to leave it in a shaded and cool spot and water regularly until it can be laid in the soil. Sod must be watered every day for the first two weeks after installation. Be sure to water in the early mornings or at dusk for cooler temperatures and to avoid the direct sunlight burning up the wet sod. As the sod takes root and warmer weather begins, extra watering can be needed. The edges of the sod should begin to meld together as the indivitual squares becoming one big green lawn. Sodding your lawn is a tricky and time consuming task. For the best results you should consider hiring a trained and professional landscape service for all your lawn and grass needs. Ready to get started on sod for your lawn? 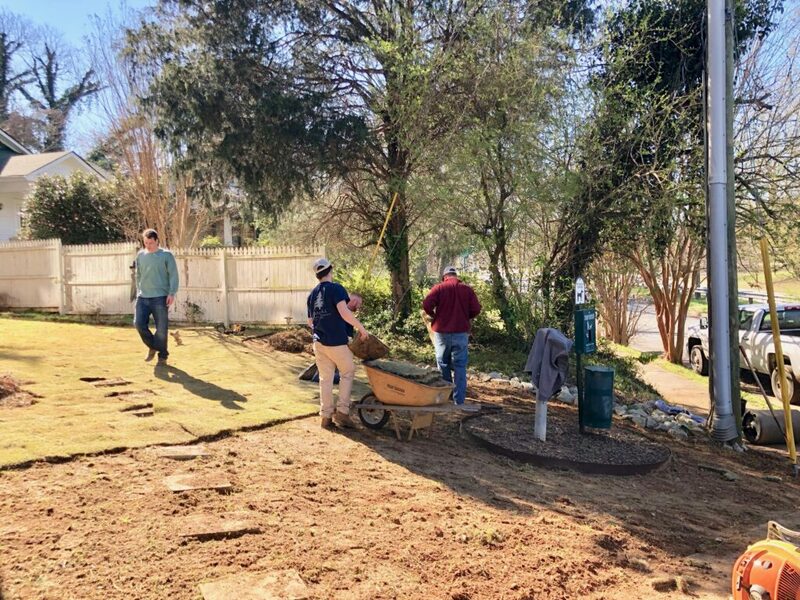 Call us at (770) 517-0555, or contact us online for your lawn and landscaping needs.